drivingandlife: HI JAGUAR. BREATHE EASY, ALFIERI IS DELAYED! Pitched squarely at Jaguar’s F-Type, the Maserati Alfieri 2+2 has apparently been put on hold, indefinitely, so the British carmaker can relax – for now. Following its debut in Geneva 2014, the Alfieri, which is based on a Ghibli platform, but offering V8 power, was supposed to be formally announced in 2016, for production in 2017. However, as Fiat Chrysler Automobiles is heavily mired in ever-growing debt, and the Chinese GT market has plateaued, it seems Maserati does not have an appetite for risk. The Alfieri was supposed to come with a 460hp V8, plus a V6 producing either 303hp or 404hp – all with the transaxle from the Granturismo and carbon ceramic brakes. The weight target was 1400kg, which would make it a definite threat to the Jaguar F-type and Porsche 911. 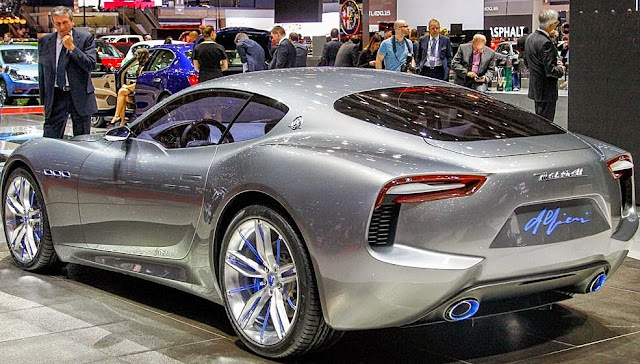 Named after one of the original Maserati brothers, the Alfieri was designed by FIAT's Lorenzo Ramaciotti. However, if you had your pen poised over your checkbook, then put it away. The wait is on. Maybe we’ll see it after Sr. Marchionne refinances some of those huge loans.